Westwires Recording USA started back in 1983 as an artist's studio. Through its dedication, relationships and word of mouth referrals, it has emerged as the premier studio in the Lehigh Valley for recording original music. Serving signed and unsigned artists, we have worked with over 200 artists in all genres. Labels such as Universal, Drimala and Spitfire have trusted their acts to our production skills. Our studio is equipped with digital hard disc recording, analog tape recording and digital audio workstations that offer over 30 hours of 48 tracks of recording using the most versatile software and highest quality A/D converters in the industry. Our DAW provides high definition 24bit/192Khz recording for DVD Audio and HDCD productions. Our mixing console is completely automated and all equipment is synchronized for glitch-free, harmonious operation. 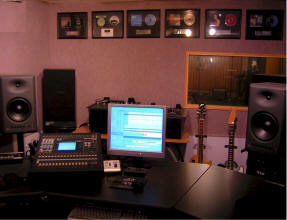 All functions in the studio are automated for total recall of your project. Microphones are special here. We have collectable ribbons from RCA, tubes from Sony as well as other new and collectable mics from ADK, AKG, Audio Technica, American Dynamics, CAD, Neumann, Nakamichi, Rode, Sennheiser and Shure. Over 40 microphones in all and still growing. We believe there is a perfect mic for each instrument and situation. Our compliment of guitars, amps, drums, percussion, keyboards, modules and drum machines will satisfy the most demanding situation. We also arrange talent as needed for your project. Personal monitoring stations for each member of the band provide your own mix that will keep you tuned in and inspire you to play. Of course we have lots of outboard gear both analog and digital. Mic preamps, limiters, compressors and DSPs from names like Focusrite, TC Electronic, Aphex, DBX, Symetrix, Antares and Yamaha. A relaxing and creative environment, we have a lounge with refreshments and TV, a silent HVAC system, isolation rooms, access to restaurants and minutes from major highways. Copyright 1983 -2015 Westwires Recording USA.